But a few extra bibs in different pinks wouldn't hurt.. or ruffly baby bottoms.. :) They are too hard to resist. I saw a cute pattern somewhere the other day where the dress was open in the back smock like so that you could see the ruffly baby bottom.. OH SO CUTE.. You just wanna squeeeeee. Боже мой! Доченька!!! Как же это здорово!!! Счастья и радости, удачи и здоровья!!! O, dear! A little daughter!!! What great news!!! I wish you happiness, joy, luck and health!!! wonderful allison! little girls are just the best. how fun to be setting aside a pile o' pink for you new little one! Congratulations. It's a sweet blessing having *new colors* to mix things up! That is such wonderful news! I happen to have 3 kids…all girls! What a sweet blessing. My husband is actually thinking he'd like to go for a fourth! Yay! I've got two little girls and I'm here to tell you that there's no such thing as too much pink. Congratulations on a baby girl!! They are so much fun to decorate for and to dress up!! Love the pic of the pile of fabric! What line or where did you get the red/aqua pieces?? That is my new love and I am redoing my bedroom with it!!! I love it!! How wonderful! Enjoy exploring all the girly new projects! How exciting! Get ready, you'll spend twice as much money on clothes for this child as you did for boys. Little girl clothes are so darn cute! Have a happy pink dream! Congrats! Have fun collecting all the pretty girl colors! Oh what fun! Pink goes with everything, even my granddaughter's bright red hair. Congratulations! Wonderful! My daughter is having a girl and she want purple for her quillt, but so far she has made pink booties and wants a pink bib- go figure. Congratulations !! and have fun with pink! Oh boy! I mean, GIRL! I have three boys and then came our little princess and it's been SO.DANG.FUN. mixing it up with the pinks all around! Congratulations! Best wishes for a healthy, happy baby GIRL! I love sewing with pink!!! Especially pink and green or pink and brown!! Congrats!!!! She is lucky to have a mom that can create such beautiful things for her!! Can't wait to see what fun ideas you come up with! I have 2 boys and now have a one year old girl. It is so much fun the boys love her. Congrats to you Allison! Congratulations! I always wanted a girl but had one boy (crazy about him). Then I got a daughter-in-law and it made everything just right (though she's not crazy about pink and won't let me dress her up in fluffy clothes ~ teehee). That is so exciting! I dream of someday having a baby girl… the lightsabers and guns are starting to get to me! LOL! I'm expecting my first girl too! 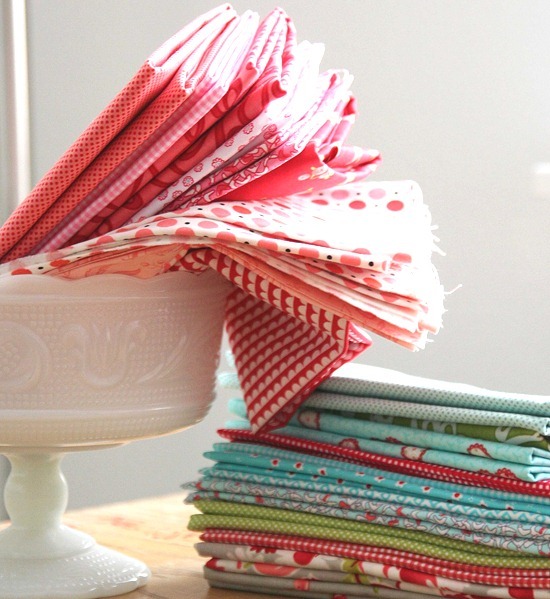 Once you start buying those pink and girlie fabrics you wont look back :)…and there's no stopping:). Congratulations! Girls are so much fun. I just had my girl two weeks ago. For someone so tiny, there is a giant pile of pink laundry at all times. I kind of love it though, very different from the truck, car, dinosaur and Lego clothes I've been immersed in for four years. Woo hoo! Fun to have a mix of boys and girls. Have fun adding in pink! Yay! No switcheroos for you, then? Hee hee, congrats, I'm excited! A GIRL!!! Very exciting:) Congratulations!!!!! Congratulations. I know how excited you must be. I think having a girl is so much fun for us crafty girls. I look forward to seeing your pink creations. Congratulations!!! I can't wait to see what pink things you sew for her. Congratulations! I had three precious baby girls myself and one sweet boy, too. Best wishes to you and baby girl! Congratulations! My DR assured me a few times that he was 95% sure it was a girl, and I went nuts buying pink fabric. I was so worried that when the baby arrived it would be another boy, but no, thankfully she was a girl! My favorite colors were blue and green, but now I find myself loving lots of warm colors too. Congratulations! We have two daughters and six grand-daughters, so we use A LOT of pink in projects around here. Have fun sewing for a sweet new baby girl! Yahoo!!! Congratulations! I'm glad for any healthy baby, but as the mom of 3 girls, I am super duper happy for you! I foresee very fun sewing in your future! congratulations, on having a little girl. I had a little girl and sewed a lot for her but now I have two grandsons and the fabrics and patterns are so much sweeter for little girls but I love them to death. We too had two boys and a girl. She sure does change the family dynamics and they are a wonderful balance to a boy dominated family. I feel your excitement and remember how happy I was when I found out too. Congratulations. May she bring you and your family so much joy. Congratulations on a baby girl. Pink is a beautiful colour, you will have lots of fun. Congratulations Allison! My daughter loves to wear frilly skirts and her brother's jerseys. A good combo, I guess :) Just not together. I buy pink fabric just so I can look at it whenever I want. I'm the only estrogen in the house. Besides the cat, that is. How terrific!!! Congratulations!!!! Little girls are oh so fun to quilt for!!! Blessings to you! Congratulations! It's so fun sewing for a little girl. Oh congratulations!!! i live in boy land and would love a little girl to make more pink things!!! Congrats!! You will LOVE sewing for girls. Endless patterns. http://www.flickr.com/photos/iveyc95/sets/72157603244082495/ Here is a great beginning for inspiration. Love her talent! Congratulations! I gave birth to a sweet baby girl in August, and I can't even tell you how much FUN I had sewing pink stuff for her! Congratulations Allison! Girls are a blessing. I'm so happy we can share your joy these next few months. I look forward to your quilts after Christmas. Congratulations! I can't wait to see what you make! Be careful – my sister had 6 ultrasounds that said Nicolas was a girl – he had drawers full of pink waiting for him!!!! Congratulations! I'm the mother of 3 (now grown) daughters and they have been a delight at every age. Buy a ruffler attachment for your machine now. You're going to need it. What great news…congrats to you and your family! Bring on the pink and ruffles too. Congratulations on your girl. We had 5 boys, then a girl. She has them all wrapped around her finger still and she's 17 ! Enjoy your blessing. Congratulations! Great news…let the pinky fun begin! Congratulations! I can hardly wait to see all of the wonderful baby creations you'll be making! I am so excited for you Allison!!!! Not sure how you do it all… I have an 8 week old son and have yet to start quilting again. I'm sad about it, I have fabric waiting to be cut but I'm too damn tired to get started. Tell me I'll get back into the swing of things? Lie to me!!! Allison! I just made the connection that this is you! :) You are amazing!!! Congrats on baby girl!!! Congratulations! My "little" girl turned 17 yesterday and her request: PINK balloons for the party….what is it about this joyful happy colour? It makes everyone smile. Enjoy this new colour in your life. I just had my ultra sound on Thursday and it's a boy- which will bring the total to 4 boys and I girl. So there isn't a lot of pink happening over here (much to my daughter's chagrin!). Yay! Snips and snails and puppy dog tails are so overrated. HAHA!! Good choice on waiting until after Christmas- those spring lines are a KILLER! Yay for you! so excited to see what fun girly quilts you come up with. So exciting! Can't wait to see all of the girly creations. :) Congrats! Congratulations!!! My daughter didn't like pink, but my niece loves everything she owns in pink. I hope yours grows to love pink as much as you do. oh.my.stinkin'.goodness!!!! I just had to say, YAY!!!! So excited for you, both for a baby #3, and that you're having a girl! Wahoo!!! Congratulations to you and your family and best wishes for an uneventful pregnancy and labour from here on out. Yay! Bring on the pink :) Enjoy every step of this amazing process! Congratulations! Enjoy every moment of your little girl! They are so much fun!! I love having a daughter and i honestly wouldn't mind if all I had were girls, yeah, even with all the emotions that come with them. They are just so fun! Enjoy all those great pinks! Congrats! You will love having a girl! Can't wait to see what you make for her!